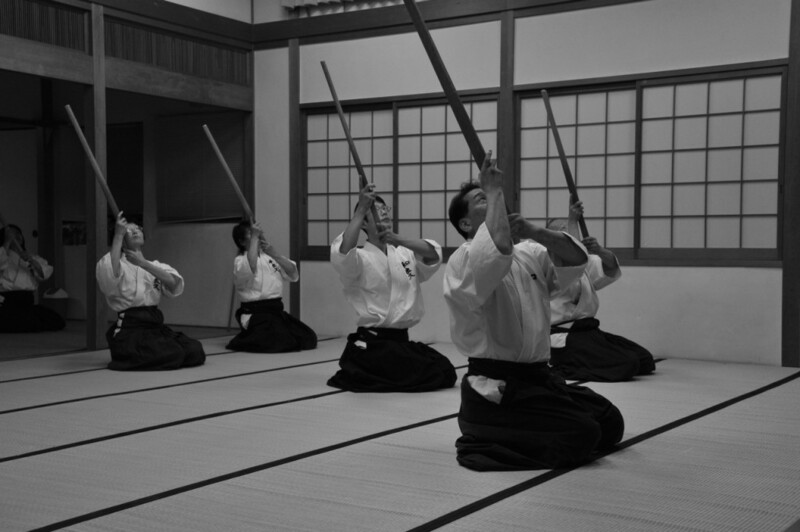 To develop budo (martial arts) is called “稽古keiko”, not “練習renshu” unlike other sports. Keiko is to think about the antiquity. By antiquity I mean the times when our body and mind were purer. And if you ask when those times were, I answer it can only be the times called “神代kamiyo” (gods’ ages). And I believe keiko is to tune into this exquisite and pure world of kamiyo, in other words, to reflect on oneself. Keiko is a “matsurigoto”, an act of worship or praying, to connect our body and mind to kamiyo. “Matsurigoto” is to “mattaku tsuriawaseru”, to completely balance. It means the state of man and god being completely one. “Matsurigoto” is a field of deep prayer. By voicing this we become one with god and one with the universe. And when you make the connection vertically, you also make it horizontally. By praying we are assimilated into one consciousness. When we tune our mental time and turn our thoughts to heaven we become white and eventually transparent. I believe that is Kamiyo. I’d like to refresh myself on this day and concentrate on keiko so that I can see kamiyo with all the people with the same aspiration. It is written in Kojiki that the god created this world with a pike. That means 武bu (military arts) originated not from destruction but from the art of creation like the creation of nations or human resources creation. I believe having men fight with each other and decide victory or defeat thus training to develop the body and mind through fighting, does not fit in the way of Yamato (Japan). The survival of the fittest or the law of the jungle is not the way of Yamato which respects wa (harmony). This is not only budo but it is the tendency of modern society itself. As long as we uphold “fight and win” as the goal of training we cannot expect the world of harmony to arrive. One of the causes for this, I believe, is that we put the starting point on Bushido (the code of the samurai) in the medieval period and applying the art of killing and its idealism of the warring times to the present day Japan. Even today when we are approaching the pinnacle of civilization we repeat the tragedy of a nation fighting with nation and men fighting with men for rights and concessions, thus making the powerless and the weak war victims suffering for hunger and sickness. This is nothing but a real hell on this earth. What is needed now in today’s world is not to inspire fighting spirit beyond necessity and defeat the opponent and win but to calm our minds and learn to make the best use of human resources. We should hurt no more. Live and let live; let us be good for both you and me. Let’s keep this in mind and let go of our egotistic mind. Let’s turn the clock back to the warless times and go back to blissful kamiyo, and make it shine like the light of spring. Let’s explore the primordial power of creation of the universe through our body. We are determined to ban all destructive military powers in this world and work toward the realization of the harmonious and loving unification of human race through our body.